SF 2 passed out of the full Senate Judiciary Committee on January 31, on a party line vote of eight Republicans supporting and five Democrats opposing. SF 2 redirects taxpayer funds away from facilities offering abortions to whole health care clinics which are far more numerous (over 200) throughout the state and offer a wider range of healthcare services. Click here to read the bill and track its status. Sen. Brad Zaun (R-District 20) displayed strategic leadership by calling a caucus directly before the hearing which in effect foiled Sen. Janet Petersen’s (D-District 18) plan to block bill supporters from the hearing when she reserved the room beforehand allowing only Planned Parenthood (PP) protestors to enter an ‘invitation only’ meeting. Sen. Amy Sinclair (R-District 14) gave the subcommittee report and shared that her district, like others, had no PP clinic and this bill would increase accessibility to over 200 federally qualified clinics which offer a wider range of full healthcare services, a benefit for Iowans in rural areas across the state. Status: The bil l is eligible for debate in the Iowa Senate as early as today, January 2. It should pass, but likely not without some tantrums from those who are more concerned about funneling money to friends at PP than to healthcare for the Iowans they represent. Members of the House expect to take up the measure shortly, whether it’s SF 2 or a companion bill already in progress. 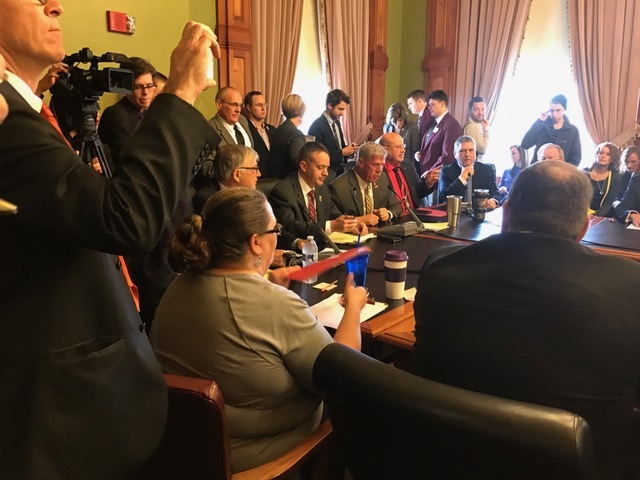 The process will likely be a repeat of the Senate and pro-life, constitutionally-minded Iowans will need to email, phone and visit district offices and attend committee hearings to support House members when the time comes. 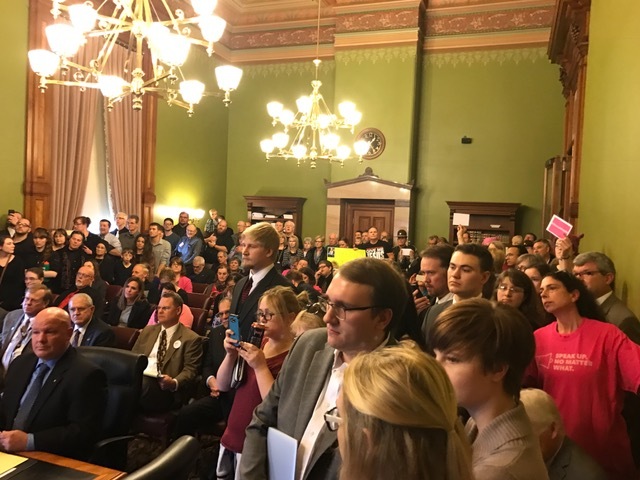 Hundreds of pro-life activists attended the Senate hearings, greatly encouraging and supporting legislators who faced hostility, name-calling, and even remarks of eternal condemnation. They deserve our gratitude. Click here to read the statues of the bill. If it has not yet been voted on by the Senate please contact your senator and ask him to vote YES on SF 2. Be sure to let him know that you are a member of “Concerned Women for America of Iowa”. Click here to find out who your senator is and how to contact him/her. Below are Senate members who sponsored the bill. If you haven’t already, please send them a note of thanks using this format: lastname@legis.iowa.gov. Please write “CWA thanks you for SF 2” in the subject line. Be sure to let them know what you are a member of “Concerned Women for America of Iowa”. Amy Sinclair (R-District 14), Bill Anderson (R-District 3), Jerry Behn (R-District 24), Rick Bertrand (R-District 7), Michael Breitbach (R-District 28), Waylon Brown (R-District 26), Jake Chapman (R-District 10), Mark Chelgren (R-District 41), Mark Costello (R-District 12), Dan Dawson (R-District 8), Bill Dix (R-District 25), Jeff Eder (R-District 35), Randy Feenstra (R-District 2), Julian Garrett (R-District 13), Tom Green (R-District 44), Dennis Guth (R-District 4), Craig Johnson (R-District 32), Tim Kapucian (R-District 38), Tim Kraayenbrink (R-District 5), Mark Lofgren (R-District 46), Ken Rozenboom (R-District 40), Charles Schneider (R-District 22), Jason Schultz (R-District 9), Mark Segebart (R-District 66), Tom Shipley (R-District 11), Roby Smith (R-District 47), Jack Whitver (R-District 19), Brad Zaun (R-District 20), and Dan Zumbach (R-District 48). Watch our Facebook page, Concerned Women for America of Iowa, for updates and keep an eye out for action e-alerts. If you’re part of our Encourage-A-Legislator program, please be sure to be sending those postcards to your assigned legislator or leader and be praying for them as 1 Timothy 2:1-2 instructs. Contact director@iowa.cwfa.org to see how you can join a team of committed men and women in restoring our state and honoring God in our homes, churches and communities. Please Pray: Pray that SF 2 will pass the Senate. Pray for your Senator by name. Pray for the success of other pro-life bills currently being worked on behind the scenes as they will soon be introduced. Regularly pray for the legislators and their families. Thank you to all CWA of Iowa members and friends who participated in some way to encourage legislators in the SF 2 process. As CWA of Iowa’s State Director, I will try to keep informed so you can continue to encourage House members to stand strong as more pro-life bills are expected in the Iowa legislature this session.